Should everyone win a trophy? Can everyone come in first place? Can everyone win the game? This question was brought up again at a recent event that I was at. A parent was upset (and that is an understatement; more like devastated) that her child was not going to win a trophy or medal. So much so that she didn’t allow her child to even attend the ceremony. The problem with not going to the ceremony was that they really missed out on a beautiful time where the coaches affirmed all the kids. They may not have all gotten a team award, but they all received a certificate and were affirmed in some way. The learning experience for these kids that was explained and taught was priceless. The whole atmosphere was not about winning or losing but honoring these kids in a fun, and in many cases humorous way. All the kids and parents had a great time. Well except for the one family who decided to miss it. And miss out they did! Sometimes we get stuck in a way of thinking that could cause our kids to miss out on an opportunity to learn or mature in a safe and protected way. I get the whole idea of trying to protect our kids from disappointment, but sometimes it is that very thing that if handled right could be so valuable in their growth. Parents have to be so careful to check and make sure they are not reacting out of their own unresolved hurt. We can protect our kids from something that they really don’t need protecting from. We can project our own feelings on to them and cause them to miss valuable growing opportunities. 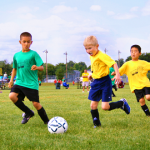 Sports can really be used to help prepare our kids for the long journey ahead, which will inevitably include difficult and often heartbreaking experiences. With every kid getting the trophy, it seems to minimize the value and importance of those who really did something extra to earn it. I know in our home, the trophies that got tossed into the “give away pile” were those that the whole team received just for showing up. They just didn’t mean as much to our kids. It is commendable to show up and participate, and this is where the coach can grab the opportunity to affirm the kids individually and say out loud in front of the others what they appreciate about that child. Can you imagine every kid in class getting an “A” on his or her spelling test even if they missed half the words and didn’t study or prepare for the test? What about all the participants in the spelling bee winning even if they missed the first word? I wonder how the actual national champion would feel about that. Can you imagine how long it would take to play all the nation anthems at the Olympic games for every event so that you wouldn’t upset each country that didn’t win? And can you imagine how big the winners’ platform would have to be? 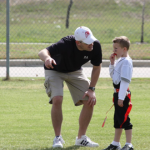 The opportunity to use sports as a tool to help our kids learn how to respond to a winning situation and a losing situation can be crucial to their character development. I think we as parents can do our due diligence to find the right kind of sports programs where these values are taught and modeled in a fun and safe atmosphere. Instead of assuming that all award ceremonies are bad, know that it is often worth it to let our kids experience the thrill of victory and the agony of defeat. Sometimes their team wins and they win the “blue ribbon” and sometimes their team comes in last place and they go home without the “trophy”. Both situations in the right environment can help our kids grow. So, let’s keep the winners’ podium the same size and let’s play one national anthem!